Is your Whirlpool direct drive washer making loud/strange noises in spin cycle or during agitation? 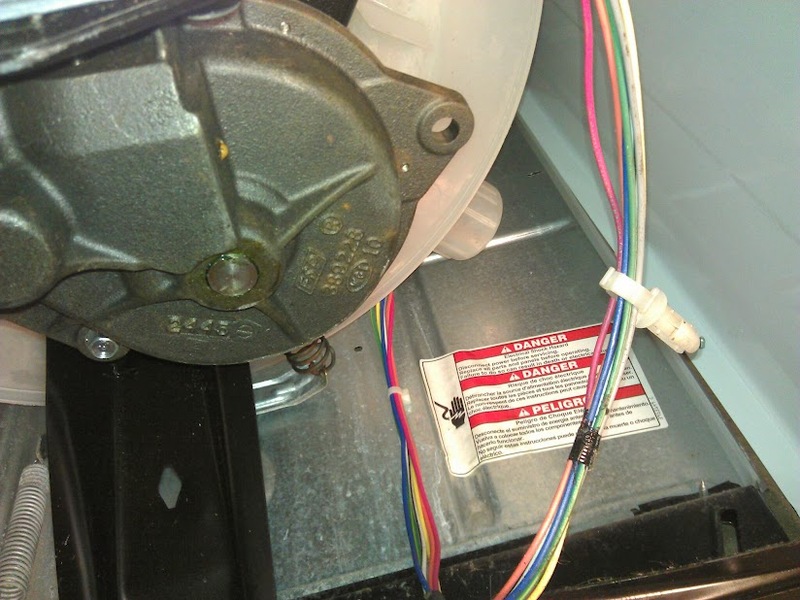 This post will show you how to isolate your Whirlpool transmission from your washer in order to troubleshoot what the cause of the noise is. 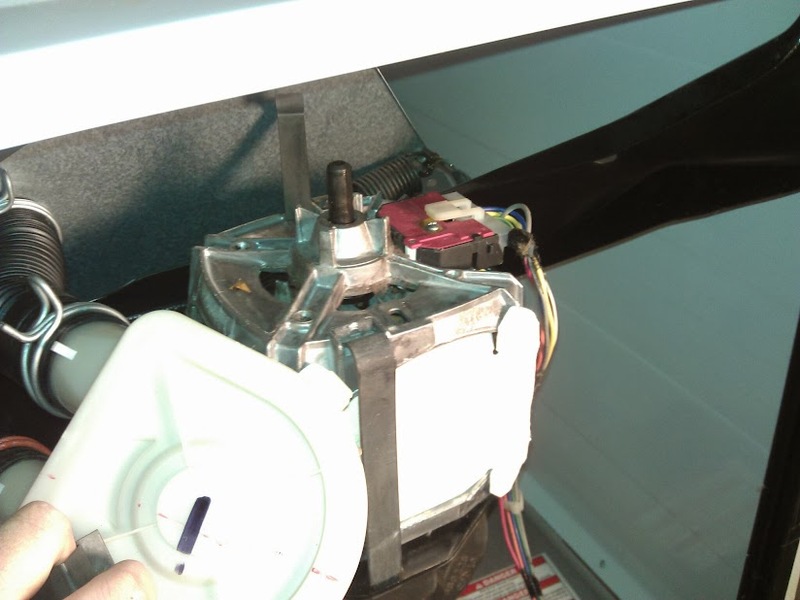 This post will also show you how to replace the transmission in your direct drive washing machine. For your convenience, you can read the step by step instructions or watch the video at the bottom of this post. If you need to replace your Whirlpool transmission, you can either replace your transmission with a used transmission or purchase a new one. The most common direct drive transmission is part number 3360629, but you can insert your model number in the search box at the bottom of the page to be sure you have the correct transmission for your washing machine. 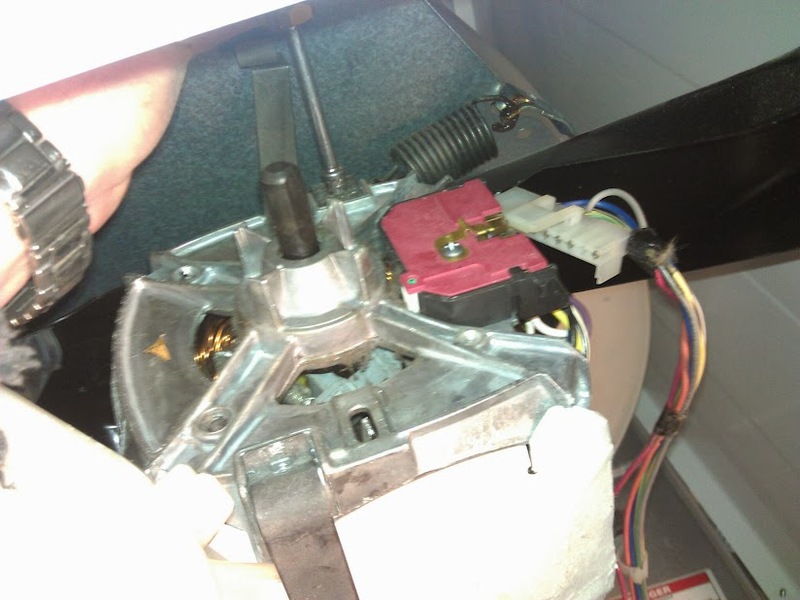 First, let’s identify if you have a Whirlpool direct drive washer. 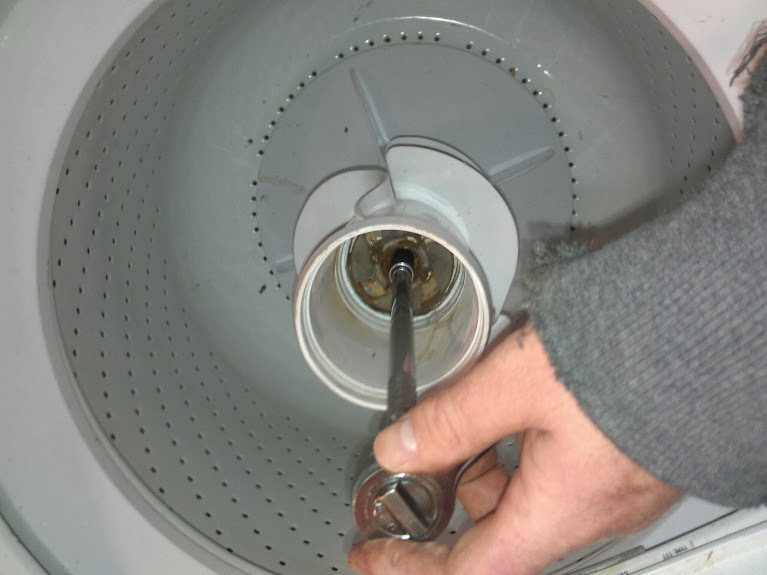 If you look under your machine, and it looks almost exactly like the picture below, you have a direct drive washer. 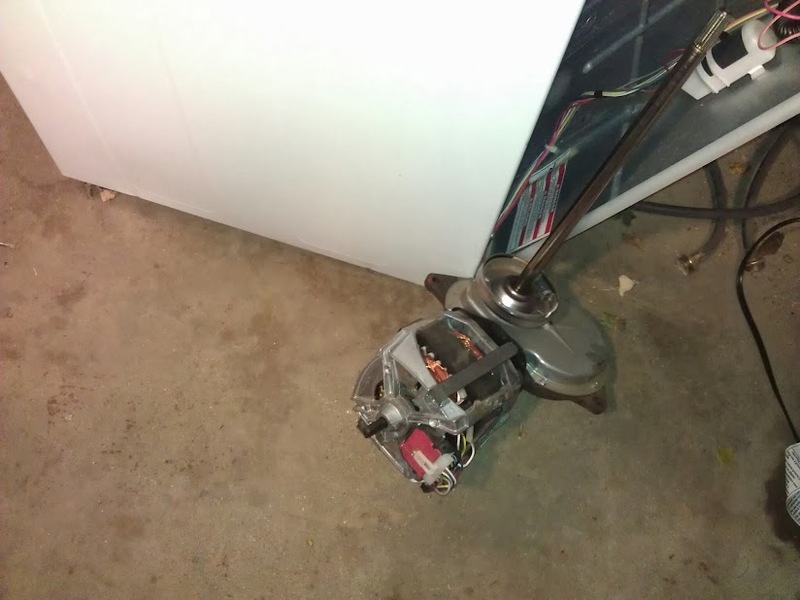 Most appliance repair guys would tell you to keep these machines as long as you can. They are good reliable machines, easy to fix, and parts for the most part are cheaper then most of the newer appliance coming out. 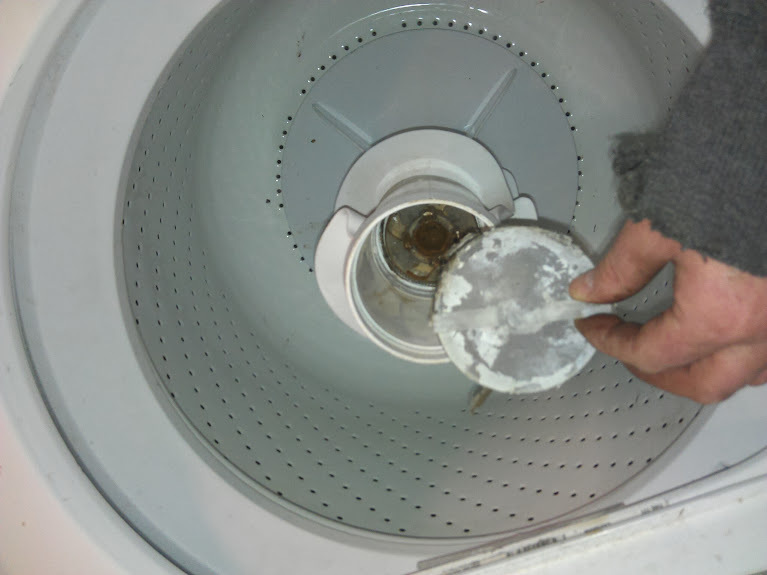 If you determine that you do have a direct drive washing machine, continue to the next step. I’d recommend moving your washing machine to the garage or outside for the sake of room and to not make a mess. If you choose to do the repair in your laundry room, you will need to unplug your washer from the wall outlet and turn off the water to your machine. You will also need to unhook your hoses from the back of the machine. The first thing that you need to do is open up the lid and remove your detergent dispenser. You can pull it right up with your hands, no tools required. Next remove the dust cap. Now remove the 7/16 hex head bolt. Once the bolt is removed, you can remove the agitiator by pulling up on it from the bottom (watch your face). After the agitator is removed you will see two small parts that located on the spline of the transmission remove those and set them aside (picture coming soon). Now you can carefully place the washer on its back. Be very careful with the inlet valve. (The plastic part where your hoses screw in the back of your washer.) 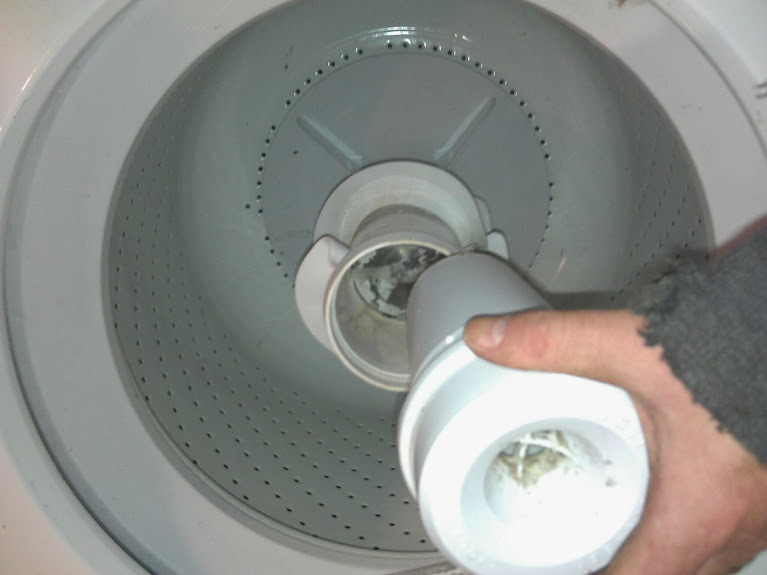 Once you washer is on it’s back, remove the pump by popping off the two clips that hold the pump in place. Move the pump out of the way. Remove the wiring harness from the motor. Remove the plastic clip on the transmission that holds the wiring harness. Now remove the (3) 1/2″ bolts that hold the transmission into place. Move pump out of the way. Remove wiring harness from motor. Remove wiring harness from transmission. Remove the (3) 1/2″ bolts from transmission. Once the 3 bolts are removed from the transmission, the transmission along with the motor can be pulled out. 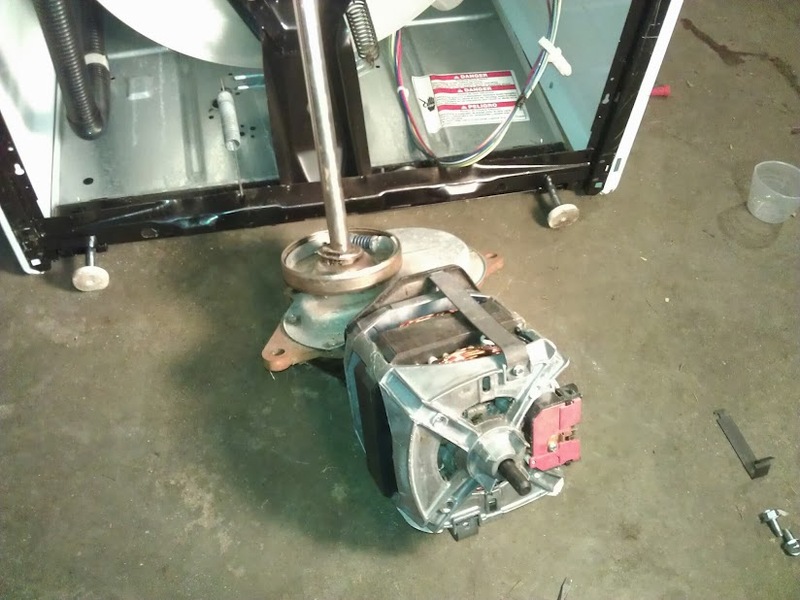 If you are going to replace your transmission, at this point, you can remove the motor from the transmission and then hook your motor up to the new transmission, but to test the transmission, we will put the washing machine back on it’s feet. Open up the control panel and then pop the two golden clips that secure the cabinet to rear panel of the machine. Now we can run the wring harness back to the motor, carefully plug the washer into the wall outlet and then put the washer into spin cycle. (You can also run this test in the agitation cycle, but you would need to fill the washer up with water to do so.) . If your transmission is making funky noises, and you know the motor coupling is good, replace your transmission. If your transmission isn’t making any funky noises, you know that your problem is down stream, for example your the shoes on your basket drive may be dragging. Wiring harness plugged back into the motor.